In her capacity as the UN Secretary-General’s Special Advocate for Inclusive Finance for Development, Her Majesty Queen Máxima will visit New York from the afternoon of Monday 24 September to Wednesday 26 September on the occasion of the United Nations General Assembly. 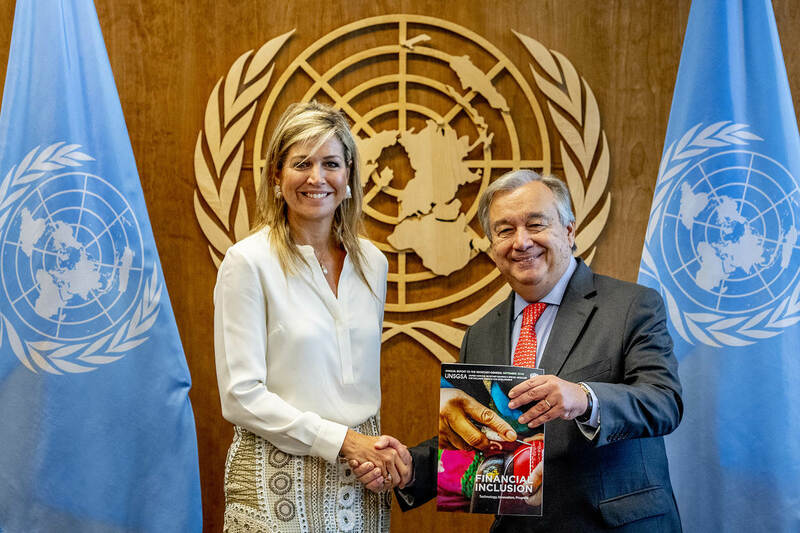 Queen Máxima hands over her 2018 Annual Report on financial inclusion to UN Secretary-General Guterres. On Tuesday morning, Queen Máxima will take part in a Mastercard breakfast event with several companies to discuss how they can help improve access to financial services. According to the World Bank Group, safe and affordable access to bank and savings accounts, insurance, loans and pensions contributes to the economic and social development of low-income groups. Some 1.7 billion adults (Global Findex 2017) still do not have access to these services. At the invitation of Queen Máxima, the CEO Partnership for Financial Inclusion met for the first time during the World Economic Forum in Davos in January this year. This is an informal partnership of ten multinational companies (Ant Financial, AXA, Bharti Airtel, Mastercard, PayPal, PepsiCo, Rabobank, Santander Bank, Telenor and Unilever). The companies’ CEOs agreed to share their knowledge and experience and to work together to increase financial inclusion. Queen Máxima will attend the plenary meeting and hold bilateral talks with several of the CEOs. In the afternoon, Queen Máxima will attend a meeting of the Women Entrepreneurs Finance Initiative (We-Fi). This initiative, hosted by the World Bank Group, seeks to unlock financing for women entrepreneurs in developing countries. Seventy percent of these women are unable to apply for affordable formal loans to set up or expand their businesses. Investing in female enterprise is more than simply investing in a successful business that creates jobs. Studies by the World Bank show that women in particular tend to invest their income in the wellbeing and future of their children and families. The decision to set up We-Fi was taken by the leaders of the G20 in Hamburg in July 2017. During the We-Fi meeting, Queen Máxima will also take part in a discussion chaired by the World Bank’s President, Dr Jim Yong Kim. Other participants will include Her Excellency Reem Al Hashimy, Minister for International Cooperation of the United Arab Emirates, and Ivanka Trump, Advisor to the President, (tbc) who has been closely involved in We-Fi since it was established. On the morning of Wednesday 26 September, Queen Máxima and the members of the Dutch delegation will meet the UN Secretary-General António Guterres. The Queen will provide an update on her activities for the UN and present her annual report. She will then hold several bilateral talks with government representatives of countries that actively support financial inclusion and with representatives of central banks. Finally, Queen Máxima will meet with members of the Reference Group, an advisory focus group with which she works closely. The group is made up of international organisations with specific knowledge of financial inclusion, such as the Alliance for Financial Inclusion (AFI), the Better Than Cash Alliance, the Bill and Melinda Gates Foundation, the Consultative Group to Assist the Poor (CGAP), the International Monetary Fund (IMF), the Omidyar Network, the United Nations Development Programme (UNDP) and the World Bank Group (WB). Queen Máxima was appointed UN Special Advocate in 2009. She advises on universal access to financial services worldwide, focusing on the economic and social development of low-income groups and small and medium-sized enterprises. Since 2011, the Queen has been Honorary Patron of the G20 Global Partnership for Financial Inclusion (GPFI).